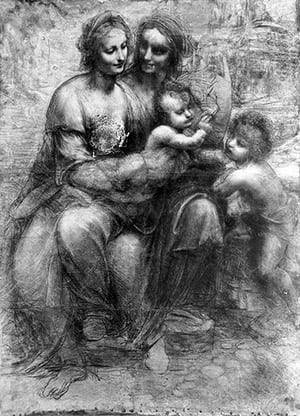 In July 1987, this drawing was damaged while on view at Britain’s National Gallery. Robert Arthur Cambridge, 37, an unemployed resident of south London, pulled a sawed-off shotgun from beneath his coat and shot at the piece from a distance of 7 feet. After firing, Cambridge sat quietly in a chair, the gun at his side, until he was arrested. The drawing, set behind a protective glass plate, was largely protected from the shotgun pellets, but suffered damage from shattered glass. It was eventually restored through an elaborate process in which dozens of tiny paper fragments were glued back together, one by one. Cambridge told police his intent had been to show his disgust with “political, social and economic conditions in Britain.” He was later sent to Broadmoor asylum, an institution for the criminally ill. This was not the first time the drawing had been attacked: In 1962, a German painter (later deemed insane) threw a bottle of ink at the piece. The bottle did not break and no ink was spilled, but slight damage, included scratches and a small cut, was inflicted. The work was quickly repaired.